Is all romance a Shavian phenomenon? It's interesting that Shaw never consummated his marriage since he seems to know so much about the mysterious compromise between instinct and consciousness that makes for the cocktail of romantic love. Frank Capra's The Bitter Tea of General Yen inaugurated the Barbara Stanwyck retrospective at Film Forum and seeing it you sometimes think you're watching Major Barbara. Megan Davis (Stanwyck) may not be a Salvation Army cadet, but she sounds like Major Barbara in her zeal to change the world and General Yen (Nils Asther) could be the resident spokesman for realpolitik, Untershaft. Edward Paramore's script is rife with Shavianisms. "Isn't it better to shoot them quickly than to let them starve slowly,"
"I'm going to convert a missionary." "we never really die, we only change"
"life, even at its best, is hardly endurable." There's a dream sequence in the film which competes with what Dali created for Hitchcock in Spellbound, as the man Megan despises comes to her in both as a devil and a God. Within the context of the film's ideological conundrums the view of colonialism is actually more sophisticated than you'll find in a more modern treatment of the theme, say in Spielberg's Empire of the Sun. Capra makes it clear that the Western drive to civilize the hordes of Chinese is only a superficial humanism predicated on a total inability to understand the complexities of the culture. 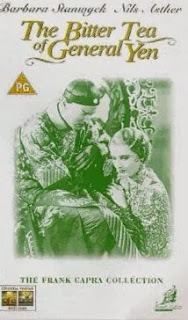 The Bitter Tea of General Yen could be taught in one of those courses which deals with the failure to import Western style democracy to either the Far or Middle East or to put it another way Edward Said's Orientalism is what Barbara Stanwyck's character is suffering from. But the real subject of Film Forum's festival is Stanwyck and in the final scene in the love crypt, replete with its Wagnerian potion, she is dazzling and enigmatic both, entering in her bejeweled gown and offering herself up to a love that can never be.